The SMART-CORE-1D operating system is a Linux system. This operating system enables faster and more stable processing; the continuous power service life can be up to 10 years. SCHIDERON UControl is an IP-based control system that takes advantage of new possibilities for control and monitoring via LANs, WAN integration systems and the Internet. And this APP supports more control methods, your world is in your hands! You can control connected devices in your home or workplace from your iPhone, iPad, and Android devices anytime, anywhere. Let you safely monitor and control the entire home or business. Upload all data (including loop status, energy consumption information, etc.) of the intelligent lighting system, smart home system and room management system access module to the intelligent centralized management system. This can use powerful background processing capabilities to process resource data and improve processing efficiency. In particular, it is applied to enterprise management, school classrooms, conference studios, and other occasions as aggregation nodes for data transmission. The device has a hardware/software watchdog function, and the watchdog command has the highest priority in program interrupts. Regularly check the internal conditions of the chip, and send an automatic reset signal to the chip in the event of an error, to avoid the program from entering an infinite loop. The device has an IR learning port. After connecting to the IR receiver, it reads the IR command code sent by the specific device, and then decodes the command and stores it as a system action scenario code for the specific scene call. Through the PC-side control software, the IR command codes of various black-and-white household appliances are combined to set specific scenes. After configuring the scene to an iPad/iPhone/touch panel, etc., send the corresponding infrared code to the relevant home appliances through the IR send port to complete scene control. Multiple infrared code transmissions can be performed centrally or as delay tracking to make scene changes more comfortable. For added scalability, the SMART-CORE-2D offers a high-speed, multi-tasking system. Programmable and customized architecture allows programmers to independently develop and run device-specific programs such as lighting, HVAC, security, audio and video. System upgrade through remote network operation greatly improves customization efficiency. S-Net communication mode and TCP/IP communication mode conversion device. It serves as an intermediary device for intelligent centralized control management systems and other adjustment control devices. The device can be set up and configured through the PC control software. “Modular” equipment is flexibly installed and applied in a real environment. The system is mounted on a standard 35mm DIN rail. The DIN rail mounting provides a very space-saving, cost-effective and modular solution with an integrated and automated system. The device has over-current protection. The proprietary current protection module allows the device to protect the device from burnout by automatically shutting off the power when the current exceeds the set current, thereby extending the life of the device. The device is designed for an ARM-only hardware architecture and has local data processing and channel control. The overall power consumption of the module is low, and the task processing time. The module communicates via the dedicated bus S-Net to ensure the stability and reliability of data transmission. 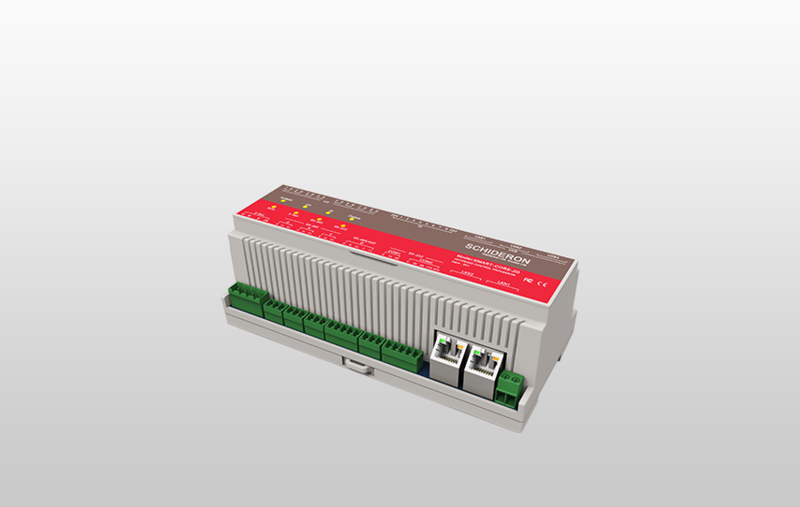 The SMART-CORE-2D is a DIN-rail mounted intelligent central control system developed by SCHIDERON that can be applied to any modern smart home and business intelligence control central control system. The entire system can be customized and integrated with different brands, different types, and different models of products to make the operation more user-friendly, more environmentally friendly, and more efficient! SMART-CORE-2D is used in smart meeting rooms, business intelligence lighting systems, smart home systems and room management systems. Through the SMART-CORE-2D, all modules of the entire system can be connected to Internet communications, and unified management is performed in the cloud based on the Internet. The UControl mobile APP of the mobile terminal (devices supporting Android and IOS operating systems) performs remote docking for system control. The SMART-CORE-2D can also be custom-programmable via S-Net to upload data from business intelligence lighting systems, smart home systems and room management systems to the corresponding smart centralized management and management system for device status management and data statistical analysis. The entire data transmission and equipment control comply with the latest industrial industry standards. The system's scene management and scene timing settings can be remotely operated through the UControl Mobile APP, which is simple and convenient and meets the needs of the current Internet of Things system.